Delaware area firefighters trained Thursday to build bracing for building collapses with trapped victims. Mark Carey of the Berlin, Sunbury, Trenton and Galena Fire District is fastening a brace together that will support a portion of a collapsed garage. 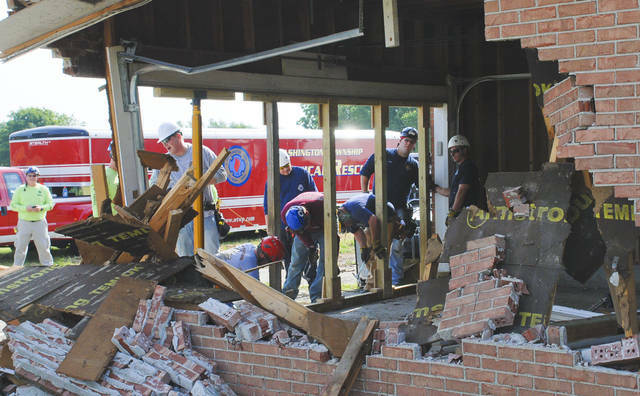 Central Ohio firefighters trained for rescues from collapsed structures Thursday in homes that are scheduled for demolition in Delaware. A car crash in the side of the garage was the scenario for the firefighters who had to build bracing to keep the structure from collapsing. 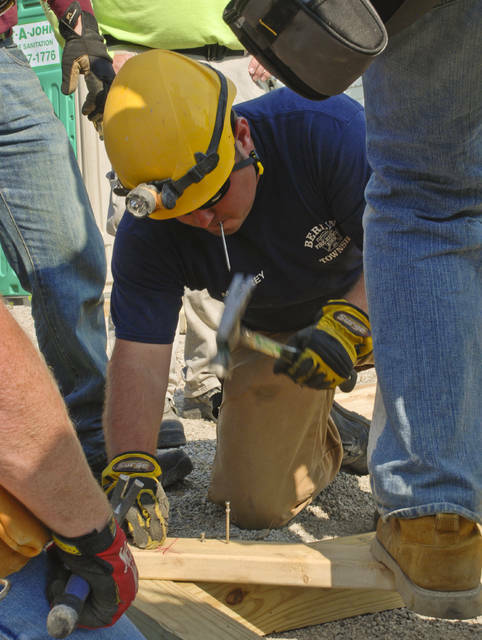 Twenty-eight Central Ohio firefighters are now better equipped to handle major emergencies. The final class of Bowling Green State University’s Certified Rescue Technician program was conducted Thursday in Delaware County. The program trains first responders how to respond quickly and efficiently to catastrophic events. Mount Gilead resident Mark Carey of the Berlin Township Fire Department said it was a good class and felt fortunate to have gotten the training. State Farm donated $20,000 to provide scholarships for the firefighters to complete the special training. Carey said the training pertained to any situation that could happen in Central Ohio. Carey said he thought eight or 10 people from Berlin’s department have taken the training. “We’re trying to get one or two people to take the class a year,” he said. Instructor Matt Scarbury has been teaching the course for 17 years. The BGSU program is divided into six rescue classes: rope, swift water, confined space, trench, auto extrication, and structural collapse. The structural collapse was segment was hosted by the Delaware City Fire Department on Stratford Road in Delaware. Capt. Dan Lobdell of the Delaware City Fire Department said Scarbury was one of his instructors. He said the department doesn’t get many calls for technical rescues involving collapses. “When we do get a call like that, whether it’s a vehicle crashed into a building or a collapse because of a fire or natural disaster, then certainly those skills we’ve trained on come into play,” he said. Lobdell said he wasn’t aware of the department ever receiving a call that involved a collapsing building because of a natural disaster, but there have been a couple of calls where the training was used. Delaware City firefighter Clint Archangel said he took the class 10 years ago. Other area firefighters who participated in the training included Donovan Whetnall of Marengo, a firefighter with the Berkshire, Sunbury, Trenton and Galena Joint fire District; Alan Baker of Powell, a firefighter for the Washington Township Fire Department in Dublin; and Timothy Strohl of Ashley, a firefighter for Elm Valley Fire District. Lobdell said if Delaware were part of a large scale disaster, the first call would be to regional and state Urban Search and Rescue teams so they could be moving toward Delaware while his team rescued victims they were able to reach. Lobdell said the state has many USAR regional teams. He said that many of the graduates go on to become members of Ohio Task Force I, which is part of the FEMA system and a designated Type I Urban Search and Rescue Team. According to a press release from State Farm, members of OHTF-1 were deployed during Hurricane Matthew in 2016. This entry was tagged Bowling Green State University, Collapse, delaware county, Fire, Rescue. Bookmark the permalink.